Where is Trump's 'military plan' for coal? 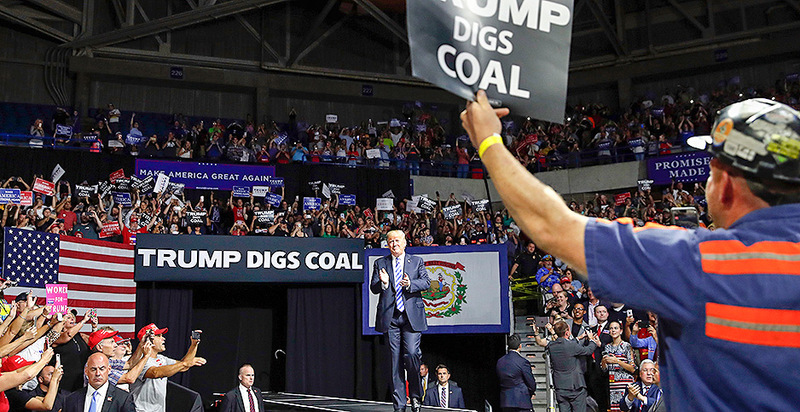 President Trump at a rally in West Virginia last night touted a "military plan" the White House is developing to boost the coal sector after casting windmills, gas pipelines and solar panels as vulnerable to wartime destruction. "You know what you can't hurt? Coal," Trump said from his podium to applause. "We're working now on a military plan that's going be something very special." But sources familiar with deliberations surrounding that policy say it's still undergoing a White House review with no definitive end in sight and is facing questions from within the White House Office of General Counsel led by Don McGahn. What's more, top administration officials crafting the policy have not yet drafted a list of at-risk coal and nuclear plants, said one source familiar with ongoing talks. On the drawing table is a policy aimed at creating a "strategic electric generation reserve" that's been undergoing an interagency review for more than two months since Trump called on Energy Secretary Rick Perry to halt the closure of nuclear and coal plants. Current policy levers on the table — as part of a broader discussion within the standard White House policy process focused on critical infrastructure writ large — include the Defense Production Act of 1950, the Fixing America's Surface Transportation (FAST) Act of 2015 and the Energy Policy Act. Perry shared in late June that his agency was working to determine the cost of the plan under consideration, but offered no details. Sources say Mira Ricardel, a deputy to White House national security adviser John Bolton, continues to lead the process. A spokesperson for the National Security Council confirmed that the policy is under review but declined to provide further detail. In addition to the NSC, the Council of Economic Advisers and the National Economic Council are also playing a role. Information about exactly what the policy would accomplish — and what statutes it would rely upon — is said to be held among a high-level group of administration political appointees. What is known is encapsulated in a 40-page draft of a Department of Energy document that was leaked earlier this year after making its way around the NSC. That language proposed the purchase of electricity from unidentified U.S. coal and nuclear power plants to prevent their "premature" retirement, citing heightened threats of cyberattacks and natural disasters (Greenwire, June 1). Sources say the questions that document attempts to tackle — which power plants are tied to military facilities and the potential for their closure — remain at the heart of ongoing White House discussions. When asked about the policy and potential pushback within the Office of General Counsel, the White House did not immediately respond. A source familiar with the deliberations said the final product won't be company-specific. That aligns with previous statements from a senior DOE official, who told E&E News in May that the NSC was not suggesting there was any economic emergency and said no single company's situation would be factored into any recommendations that might be produced (E&E News PM, May 18). Indeed, crafting a list of vulnerable coal and nuclear plants ready for aid would be complicated by still-unrevealed justifications DOE would use for channeling support to those facilities, according to interviews with energy experts. One rationale cited in the leaked DOE plan is military defense: Some power plants qualifying for aid would arguably be essential for keeping critical military installations online in a widespread grid blackout. Gas-grid interdependence would be another factor, since DOE proposed to base its policy on addressing vulnerabilities it sees in gas-fired generation because of its just-in-time dependence on supplies traveling on long-distance pipelines. DOE says coal and nuclear plants deserve an above-market price to value their on-site fuel. A third screen would seem to be financial. The plants DOE wants to aid must be losing money in daily operation. If not, why ask ratepayers to subsidize them? The Energy Information Administration's latest tally of power plants that have announced retirements lists four nuclear reactors and 48 coal plants with a summer capacity of 15,112 megawatts that have declared intentions to shut down by the end of 2020. Most of the coal plants targeted for closing are smaller, older ones whose profitability is hardest to maintain in the face of competition from cheap shale gas-fired electricity. But helping the smaller plants could be harder to justify on security grounds. And some DOE critics ask whether plants would have to show audited financial results to justify receiving subsidies. One key issue involves using Perry's short-term emergency authority as justification for subsidizing selected coal and nuclear plants for up to two years, as the leaked draft of the DOE strategy proposed. DOE's draft rested in part on Section 202(c) of the Federal Power Act, but critics note that the statute refers to emergencies: "a sudden increase in the demand for electric energy, or a shortage of electric energy or of facilities for the generation or transmission of electric energy." That definition doesn't fit DOE's goal of keeping money-losing coal and nuclear plants running so they would be available if pipeline fuel for gas-power generator were cut off by some extraordinary emergency, according to DOE's opponents on the issue. "There is no 'emergency' that could serve as the basis for using the Department's authority," a group of energy and other trade associations protested in May. The Korean War-vintage Defense Production Act authorized the federal government to order producers to sell strategic products to the military, but doesn't cover the kind of order described in the DOE draft that would require utilities to buy power from a DOE list of coal and nuclear plants, the trade groups said. One energy lobbyist who has met with DOE staff members recently said she thought they were pushing to complete the policy proposal and get it to the president. Nina Plaushin, president of the group Wires, which advocates for expanded grid transmission investment, said she and others from the organization had been with DOE officials to make their case that strategically located power lines should be part of the agency's plan for strengthening the grid against emergencies. "I didn't see DOE as negative in any sense" to Wires' views, she said. "They just are focused on what they're going to do" to support designated coal and nuclear plants and address DOE's concern about pipeline deliveries for gas-fired power plants, Plaushin added.